These Chips had a particularly firm crunch that sustained itself throughout the eating process. Each individual Chip felt like a meal. Strangely, a few smallish Chips in one go seemed to have less crunch as they melted a little in the mouth. These Kettle Cooked Chips were thick and meaty, with some curves and bends, just as you would expect of Chips cooked this way. The oil bubbles were of different heights and created a rough and uneven landscape. The color was a darkish, but bright yellow, with pale areas and oily spots. There was seasoning visible, but it was unevenly spread. The Nose Plunge Test was encouraging, as a rounded vinegary Dill Pickle burst out of the bag. 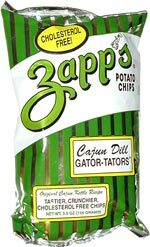 Zapp's appear to have stripped it bare with these Chips. They are Dill flavored, with a Cajun spicy heat. The hotness does not linger, neither is it too strong, but it blends well to create a variation on what is ordinarily a very powerful and commanding flavor.